The surfaces of Solar System bodies are more accessible than their interiors. The detailed surface form is observable, and the physical and chemical nature of the surface can be determined directly if samples can be obtained, or indirectly from space or from the Earth. We can also observe many surface processes in action, such as volcanism. But a surface, in the sense of being the outermost layer of a body, distinct from the interior, is not entirely accessible. Therefore, all the methods described in Chapter 4 that are used to investigate the interior are also applied to these shallow depths - seismology, gravitational and magnetic field measurements, and so on. At such depths, as well as a global picture, they also reveal regional and local details. Discovering the Solar System, Second Edition Barrie W. Jones © 2007 John Wiley & Sons, Ltd astronomers of earlier generations. The images are not restricted to visible wavelengths, but are obtained at UV, IR, and radio wavelengths too. Computer processing can extract every last bit of detail. A two-dimensional image shows variations across a surface, though some altitude information can be obtained, e.g. from the lengths of shadows cast by a feature, or from evidence that one feature is partially obscuring another. We can, however, use other means to obtain a more complete and more accurate picture of the three-dimensional form of a surface - the surface topography. One way or another we need to measure the altitude at every point on the surface -we need to perform altimetry. For the Earth, altitudes have been measured over the centuries by traditional surveying methods on land and sea, resulting in relief maps of exquisite detail, though the deep oceans were only mapped in the latter half of the twentieth century. For other planetary bodies the best altimetry data have come from spacecraft in orbit around the body. Altitudes have been obtained by sending a radar or laser pulse from the spacecraft to the surface, and timing the interval for the echo to arrive back at the spacecraft, as illustrated in Figure 6.1. The distance d of the spacecraft from the surface is then cAt/2 where c is the speed of light and At is the round-trip time of the pulse. One way to obtain the altitude from d is to measure the corresponding distance r of the spacecraft from the centre of mass of the planetary body. This distance can be obtained from the spacecraft's orbit. The altitude of the point on the surface with respect to the centre of mass is then (r-d). From the orbit we also know from where on the surface the pulse was reflected, and so the topographic map is built up. Another technique using radar is particularly useful in low orbit. This is synthetic aperture radar, in which a series of radar pulses is sent off below or to one side of the spacecraft, as in Figure 6.1. One advantage in looking sideways is that a left-right ambiguity is avoided. Each pulse illuminates a patch of ground that is much larger than in altimetry. The reflected pulse consists of echoes from every point in the patch, and these points can be distinguished by the different round-trip times and by the changes in wavelength due to the Doppler effect (Section 2.1.2). Points ahead of the spacecraft return shortened wavelengths, and points behind the spacecraft return lengthened wavelengths. Each point in a particular patch is illuminated by several successive pulses as the spacecraft moves in its orbit, and this greatly increases the spatial resolution. Synthetic aperture radar provides a three-dimensional image, and so the surface topography is obtained. Though the distance (r-d) reveals surface morphology, it is not the best way of specifying altitude. It is differences in altitude that are important, and to emphasise these differences we need to define a zero of altitude that lies within or close to the observed range. In the case of Venus, the zero chosen is the mean equatorial radius of 6051.9 km. The surface of zero altitude on Venus is thus a sphere. Figure 6.1 Pulse altimetry and synthetic aperture radar. Though the choice of a sphere seems pretty obvious, it is not sensible for the Earth and many other bodies. This is because these bodies are not as spherical as Venus, but are more flattened by their rotations: the faster the rotation, the greater the flattening; Venus rotates slowly, and so is not appreciably flattened. Consider a rotationally flattened planet in the idealised state of hydrostatic equilibrium, as in Figure 6.2. 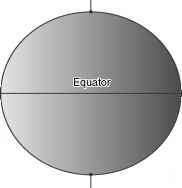 If a sphere centred on the centre of mass were used as the zero of altitude, the equator would be higher than the poles. Yet there is an important sense in which it is not downhill from equator to pole: that is, a plumb line fixed with respect to the rotating surface would hang perpendicular to the surface. Thus, for a real planetary body rotating sufficiently fast to be appreciably flattened, the natural choice of zero altitude is the surface that the body would have were it in hydrostatic equilibrium. We could calculate the exact shape and size of this ideal surface. It is, however, easier to use any fluids that are widespread at the surface of the planetary body. A fluid flows until it is in hydrostatic equilibrium. In the case of the Earth, we have the oceans ('hydrostatic' derives from 'stationary water'). For zero altitude we could select any depth of given pressure in the water, but the surface is an obvious choice, so mean sea level is defined as having zero altitude on Earth. Sea level changes with tides, winds, atmospheric pressure, currents, and the amount of sea ice, so we have to average out these effects. As far as we know, the Earth is the only planetary body with liquid covering most of its surface, but several rotationally flattened bodies are totally covered by a different sort of fluid - an atmosphere. The zero of altitude can then be defined by some value of atmospheric pressure. In the case of the giant planets, the choice is 105Pa -close to mean atmospheric pressure on the Earth's surface. Figure 6.2 A rotationally flattened planetary body in hydrostatic equilibrium. (compare equation (4.6)). The minus sign is because of the convention to take the gravitational potential to be zero at r = to; as the distance is reduced, so is the gravitational potential. Departures from spherical symmetry add extra terms, analogous to those in the case of gravitational field. Surfaces exist on which the gravitational potential is everywhere the same, except for local variations. One such equipotential surface is used to define the zero of altitude on Mars, in particular the one that has an average value of r at the equator of 3396.0 km. Some bodies, such as the Moon, have surfaces that are not closely approximated by a sphere, nor dominated by the effects of rotational flattening; nor do they have an atmosphere, nor a well-known gravitational potential. In this case zero altitude is defined by what is called a reference ellipsoid. This is a distorted sphere characterised by three different radii mutually at right angles. Saturn's large satellite Titan rotates slowly and has a massive atmosphere. How could you define its zero of altitude? The radiation from the surface of a body includes thermal emission and reflected solar radiation. The radiation can by analysed by the techniques of photometry and reflectance spectrometry outlined in Section 3.1.6 in relation to asteroids. Just as for asteroids, each technique yields information about the surface composition and surface roughness. 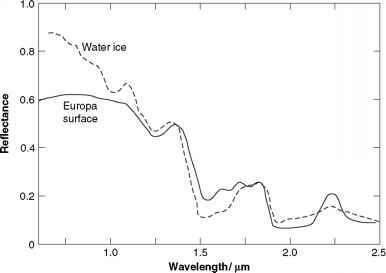 For example, Figure 6.3 shows the reflectance spectra of Europa and of coarse-grained water ice. The correspondence is close enough to conclude that water ice is the dominant constituent of Europa's surface. Figure 6.3 Reflectance spectrum of Europa and of coarse-grained water ice. With radar we provide our own illumination, at wavelengths in the approximate range of 8-700 mm (microwaves). However, radar data are not easy to interpret. The strength of the reflection depends on the angle at which the incident pulse strikes the surface, on the roughness of the surface at the scale of the wavelength used, and on the composition of the surface down to a depth of the order of 10 wavelengths. On the other hand, further information can be obtained if the radar pulse is circularly polarised. Circular polarisation is possible in any wave in which the oscillatory motion is perpendicular to the direction of travel, i.e. if it is a transverse wave. The S wave in Figure 4.7 is transverse, and so too is electromagnetic radiation. A transverse wave is circularly polarised if the oscillations rotate around the direction of travel of the wave to create something like a corkscrew. For radar, if the pulse sent is circularly polarized, then the echo will consist of a component rotating in the same direction as that sent, and a component rotating in the opposite direction. The ratio of the strength of these two reflected components provides further information on texture and composition. X-ray fluorescence spectrometry reveals the chemical elements that are present. In fluorescence the electrons in an atom are excited (raised in energy) by incoming radiation or particle bombardment. As the electrons return to their initial orbits they emit electromagnetic radiation at wavelengths characteristic of the atom. X-ray wavelengths are particularly useful, and have been observed from spacecraft, such as SMART 1 (Table 4.1), which has detected X-rays from fluorescence caused by the X-rays in solar flares. Gamma ray fluorescence spectrometry is an analogous technique, the rays usually coming from the atomic nucleus. In neutron spectrometry the energy spectrum of neutrons emitted by a substance, usually as a result of bombardment, is used to investigate chemical composition. 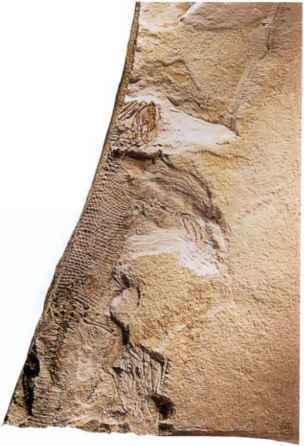 The most direct way of establishing surface composition is to examine samples from known locations. Such samples can also be radiometrically dated. The Earth has, of course, been extensively sampled, and from volcanic activity we even have samples of the upper mantle. For the Moon, we have some meteorites, plus samples brought back to Earth by various missions or analysed in situ by landers. In the case of Mars we have in situ analyses plus a few tens of meteorites of very probable Martian origin, and for Venus we have in situ analysis at four sites. Meteorites and micrometeorites provide samples of asteroids and comets. For all the other bodies in the Solar System we have no samples at all. Samples are analysed by a great battery of chemical and physical techniques, but the details are largely beyond our scope. Venus is covered in clouds that are opaque to visible and IR radiation. Describe how a spacecraft above the clouds could determine the surface morphology and composition.